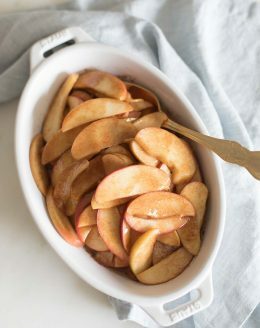 Easy Baked Apple Slices, a 4 ingredient dessert, side dish, or breakfast. This Baked Apple Slices recipe is a delicious way to enjoy your apple-picking bounty. with fresh apples, butter, cinnamon and sugar served warm and tender for a memorable fall dish! In a small baking dish, toss butter, cinnamon and sugar to coat the apples. Bake 25 minutes, or until tender.